(2) If there are two or more related cases, one under Summary Procedure and the others under ordinary procedure, then the rules on ordinary procedure will be followed. Witness: “This is the affidavit I executed”. The defense counsel, in this example, now conducts his cross examination. Of course, he must have read the affidavit beforehand. (4) Some lawyers, after adopting the affidavit as the direct testimony of the witness, then make the mistake of asking the witness questions about the statements in the affidavit. The court will remind the lawyer that the rules of Summary Procedure are being followed in the case. Please read “Gloria Lucas, complainant vs. Judge Amelia A. Fabros, MeTC, Branch 9, Manila, respondent” for the Supreme Court clarification on “motion for reconsideration” as a prohibited pleading. Sec. 11. How commenced. — The filing of criminal cases falling within the scope of this Rule shall be either by complaint or by information: Provided, however, that in Metropolitan Manila and in Chartered Cities. such cases shall be commenced only by information, except when the offense cannot be prosecuted de officio. The complaint or information shall be accompanied by the affidavits of the compliant and of his witnesses in such number of copies as there are accused plus two (2) copies for the court's files. If this requirement is not complied with within five (5) days from date of filing, the care may be dismissed. (a) If commenced by complaint. — On the basis of the compliant and the affidavits and other evidence accompanying the same, the court may dismiss the case outright for being patently without basis or merit and order the release of the amused if in custody. (b) If commenced by information. — When the case is commenced by information, or is not dismissed pursuant to the next preceding paragraph, the court shall issue an order which, together with copies of the affidavits and other evidence submitted by the prosecution, shall require the accused to submit his counter-affidavit and the affidavits of his witnesses as well as any evidence in his behalf, serving copies thereof on the complainant or prosecutor not later than ten (10) days from receipt of said order. The prosecution may file reply affidavits within ten (10) days after receipt of the counter-affidavits of the defense. Sec. 13. Arraignment and trial. 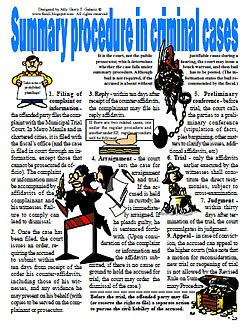 — Should the court, upon a consideration of the complaint or information and the affidavits submitted by both parties, find no cause or ground to hold the accused for trial, it shall order the dismissal of the case; otherwise, the court shall set the case for arraignment and trial. If the accused is in custody for the crime charged, he shall be immediately arraigned and if he enters a plea of guilty, he shall forthwith be sentenced. Sec. 14. Preliminary conference. — Before conducting the trial, the court shall call the parties to a preliminary conference during which a stipulation of facts may be entered into, or the propriety of allowing the accused to enter a plea of guilty to a lesser offense may be considered, or such other matters may be taken up to clarify the issues and to ensure a speedy disposition of the case. However, no admission by the accused shall be used against him unless reduced to writing and signed by the accused and his counsel. A refusal or failure to stipulate shall not prejudice the accused. Sec. 15. Procedure of trial. — At the trial, the affidavits submitted by the parties shall constitute the direct testimonies of the witnesses who executed the same. Witnesses who testified may be subjected to cross-examination, redirect or re-cross examination. Should the affiant fail to testify, his affidavit shall not be considered as competent evidence for the party presenting the affidavit, but the adverse party may utilize the same for any admissible purpose. Except in rebuttal or surrebuttal, no witness shall be allowed to testify unless his affidavit was previously submitted to the court in accordance with Section 12 hereof. However, should a party desire to present additional affidavits or counter-affidavits as part of his direct evidence, he shall so manifest during the preliminary conference, stating the purpose thereof. If allowed by the court, the additional affidavits of the prosecution or the counter-affidavits of the defense shall be submitted to the court and served on the adverse party not later than three (3) days after the termination of the preliminary conference. If the additional affidavits are presented by the prosecution, the accused may file his counter-affidavits and serve the same on the prosecution within three (3) days from such service. Sec. 16. Arrest of accused. — The court shall not order the arrest of the accused except for failure to appear whenever required. Release of the person arrested shall either be on bail or on recognizance by a responsible citizen acceptable to the court. Sec. 17. Judgment. — Where a trial has been conducted, the court shall promulgate the judgment not later than thirty (30) days after the termination of trial. Sec. 18. Referral to Lupon. — Cases requiring referral to the Lupon for conciliation under the provisions of Presidential Decree No. 1508 where there is no showing of compliance with such requirement, shall be dismissed without prejudice and may be revived only after such requirement shall have been complied with. This provision shall not apply to criminal cases where the accused was arrested without a warrant. Sec. 20. Affidavits. — The affidavits required to be submitted under this Rule shall state only facts of direct personal knowledge of the affiants which are admissible in evidence, and shall show their competence to testify to the matters stated therein. A violation of this requirement may subject the party or the counsel who submits the same to disciplinary action, and shall be cause to expunge the inadmissible affidavit or portion thereof from the record. Sec. 21. Appeal. — The judgment or final order shall be appealable to the appropriate regional trial court which shall decide the same in accordance with Section 22 of Batas Pambansa Blg. 129. The decision of the regional trial court in civil cases governed by this Rule, including forcible entry and unlawful detainer, shall be immediately executory, without prejudice to a further appeal that may be taken therefrom. Section 10 of Rule 70 shall be deemed repealed. Sec. 22. Applicability of the regular rules. — The regular procedure prescribed in the Rules of Court shall apply to the special cases herein provided for in a suppletory capacity insofar as they are not inconsistent herewith.